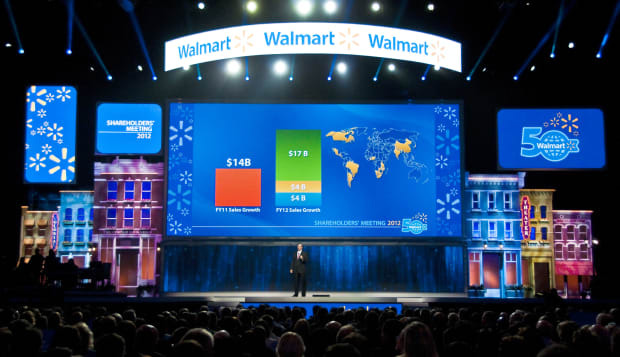 APWalmart Stores Inc.'s Chief Financial Officer Charles Holley during the Walmart shareholders' meeting in Fayetteville, Ark. It wasn't long ago that politics, like religious orientation or sexual preference, was a taboo topic in the American workplace. Political beliefs were considered a private affair - off limits to the boss. But today employers are increasingly approaching workers to fundraise, lobby and campaign in ways they never have before, according to a Reuters analysis of FEC filings and data compiled by the Business Industry Political Action Committee. The Washington trade group, which has offices across the street from the White House, helps firms such as Wal-Mart, Halliburton and Lockheed Martin mobilize employees on policy issues important to the companies. The new approach to workplace giving is called "E2E," or employer-to-employee outreach. These PACs donate to both Democrats and Republicans, depending upon who supports policies and issues favorable to the business interests of the corporation. "When you compare the amount of money the Wal-Marts and McDonald's and their employees have, compared to even the largest American unions, it's peanuts and watermelons," said Phil Smith, spokesman for the United Mine Workers of America. Employees at the nation's top firms are contributing more money than ever before to company PACs controlled by CEOs and senior management, according to April 2015 quarterly fundraising and spending documents disclosed to the U.S. election regulator, the Federal Election Commission. An analysis of FEC filings of 122 of the top company PACs shows employees raised a median 25 percent more in the first quarter of 2015 versus the same period four years ago. For the PACs analyzed, the median amount of contributions collected was $130,842. To encourage this sort of donation, some companies are attaching perks to the giving. BP, for example, says employees who donate at least 2.5 percent of their salary to the company PAC get choice parking spots in the company lot. At Wal-Mart, the company gives employees who donate to the company PAC a two-for-one match to Wal-Mart's in-house charity for store associates in need. A BP spokesman said federal law permitted "recognition gifts" such as preferred parking. Wal-Mart said it only asks salaried employees to give, not hourly ones, and that workers are free to stipulate whether their contributions go to Democratic or Republican candidates. At companies that depend heavily on government contracts, the giving is especially high. For example, employees of Honeywell International, a major manufacturer of aircraft electronics, gave more than $1 million in the first quarter of 2015 - up 52 percent since the same period in 2011. Honeywell, along with Lockheed Martin, BP and Halliburton, says its employee contributions are 100 percent voluntary and legal and that no pressure is put on employees to become more politically active. "Honeywell's PAC supports those who support policies that are good for our business and help to create jobs in the United States," company spokesman Rob Ferris said. This sharp increase in political donations by employees is fuelling concerns among some campaign finance watchdogs, ahead of the November 2016 elections, that workers may feel pressure to donate to candidates they don't support or to lobby on issues they don't agree with. "Let's say an employer decides to throw corporate resources behind a candidate and sets up a phone bank, asking employees to get on the phone to get people to support candidate Jones. It's very hard to say no to your employer. It puts the employee, especially the low-level employee, in a very difficult position." Weintraub and FEC Chairwoman Ann Ravel, also a Democrat, said they were not allowed to comment on any cases before the commission that may be related to this issue. The top Republican on the FEC, Lee Goodman, did not echo his Democratic colleagues' concerns and noted in an email that the law prohibits employers from coercing employees to make political contributions. Supporters of the employer-to-employee outreach say that it performs an important civic function by educating workers and turning them into active political participants. BIPAC says its research shows that many workers rate their employers as more credible information sources about politics than political parties, labor unions or the news media. "If it's done right, there's nothing illegal about it," said Greg Casey, president of BIPAC. Some 89 percent of the candidates its PAC supports are Republicans. The practice drew mixed reviews among a dozen employees at five companies interviewed by Reuters. "The legislators that would support the company are absolutely the ones I would never support," said one global director at Pfizer who spoke on condition of anonymity. An email sent to staff in April noted that Pfizer's employees had sent more than 8,000 emails to politicians about healthcare and patent legislation favorable to Pfizer. The Chairwoman of Pfizer's employee PAC, Sally Susman, said that, "while strictly voluntary, we encourage colleagues to raise voices on behalf of the patients we serve on important issues." Some companies go further. Before the 2012 presidential election, Koch Industries sent its employees a voter packet informing them which candidates, including Republican nominee Mitt Romney, the company supported, as well as an editorial knocking President Barack Obama. Campaign finance reformers said at the time that Koch's actions crossed the line, while Koch Industries defended its actions as "nothing unusual" and the type of thing unions did all the time. Some employees allege they have suffered retribution as a result of not supporting a CEO's politics. At Ohio-based Murray Energy, a coal mining company, plant shift forewoman Jean Cochenour said in a 2014 lawsuit that she was fired in retribution for not responding to letters she received from the company's CEO, Robert Murray, that began: "Dear Jean: The coal industry and our jobs are being destroyed by President Barack Obama. Our only hope to stop them is by electing friends of coal." The letters, samples of which were included in the pending lawsuit, identified the Republican candidates employees should donate to, and vote for, like New Hampshire Senate hopeful Scott Brown. Murray requested employees make a $200 donation to each candidate and included a self-addressed envelope for the donations, according to court documents. Cochenour also alleged that managers were required to donate at least 1 percent of their salaries to Murray's candidates. And vendors and suppliers were also required to give - lest they lose the company's business. In an emailed response to these allegations, Murray Energy spokesperson Gary Broadbent said Robert Murray never knows who gives to his personal fundraisers. He called Cochenour's statements "blatantly false and totally concocted." There are, of course, limits to what money can buy. Of the four Senate candidates Murray asked employees to support in the 2014 mid-term election, all lost.